Mi. 5:1-4; Heb. 19:5-19 | Lk. 1:39-45. Since December 17, the Gospels present to us the persons surrounding the birth of Jesus and the events leading to his birthday. We first saw the human lineage of Jesus from Abraham through David until St. Joseph himself. Then we saw the Angel Gabriel telling Zechariah that his wife Elizabeth would bear John the Baptist. We saw the Annunciation to Mary and she conceived by the Holy Spirit. Then we saw how Joseph struggled with Mary’s pregnancy since he had not touched her and how the Angel came to assure him. 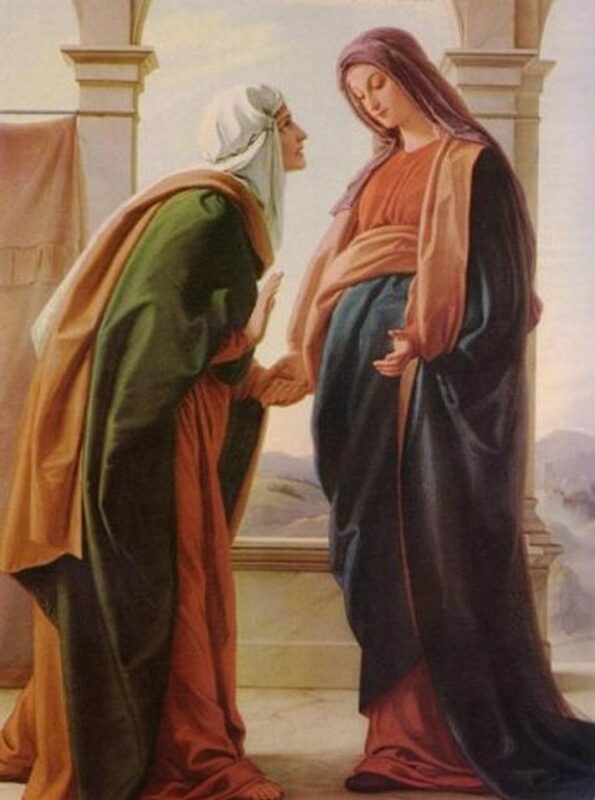 Today we are presented the mystery of the Visitation. Mary was just told by the angel Gabriel that she was to bear a son by the power of the Holy Spirit. This Child would be called Son of the Most High and Son of God. Mary knew that the God of Abraham was God Most High. And yet she seemed not to think much about it because as soon as she heard that Elizabeth her cousin was six months pregnant, she thought of visiting her to help her in a difficult pregnancy. Mary was always thinking of others first and she wasted no time to go to help her older cousin. The distance from Nazareth to Ein Karem was some two to three days walk or on donkey and she had to join a caravan from Galilee to Judah. But it did not deter her. Her only thought was to be of help to an older cousin. She gives us an example of humility and love for neighbor. As Mary travelled, many Fathers of the Church said that Mary, who was then pregnant with Jesus for only a few days, was like the Ark of the Covenant in the Old Testament carrying God’s presence among us. Then her voice carried more than just a greeting to Elizabeth, because it created a miraculous reaction on the baby in Elizabeth’s womb. The six month old fetus leaped for joy in the womb. St. Ambrose put it this way: “Elizabeth is the first to hear Mary’s voice, but John is the first to be aware of grace. Elizabeth hears with the ears of the body, but John leaps for joy at the meaning of the mystery. Elizabeth is aware of Mary’s presence, but John is aware of the Lord’s: a woman aware of a woman’s presence, the forerunner aware of the pledge of our salvation. The women speak of the grace they have received while the children are active in secret, unfolding the mystery of love with the help of their mothers.” This was indeed a miracle because the babies were still in their mothers’ womb. John while still in the womb was already a prophet pointing to Christ also in the womb of Mary. Elizabeth’s words also strengthen our faith: “How does this happen to me that the Mother of my Lord should come to me?” The word Lord in the Greek is Kurios which is a translation of Jhwh, the name of God in the Old Testament. That Mary is Mother of God before being made a dogma was a word of Scripture, given to us by the mother of John the Baptist. Let us be thankful to St. Luke for narrating to us this wonderful mystery of our faith. As we contemplate this event let us renew our faith in who Jesus is and who Mary his Mother is for us. John and Elizabeth are God’s instruments of revelation for us: Elizabeth’s words and John’s leaping in the womb. And as we come close to Christmas night, let us realize that we are indeed witnessing the mysteries of our salvation. Let us open our minds and hearts and take in the graces offered us by God and the Mother Church. Let us see not only the material gifts and presents we receive this Christmas, but most of all let us appreciate and take in the interior gifts of grace and salvation offered to us by God and our Mother Church. Let our thanksgiving overflow for truly God is good!